This is the week when Microsoft finally starts selling Windows 7, its much-improved successor to the disappointing Vista version of Windows. PC makers, who have suffered from Vista’s poor reputation, will begin touting models that come with Windows 7, which I praised in a detailed review earlier this month. But Microsoft’s (MSFT) historic rival, Apple (AAPL), isn’t sitting still. After releasing its own new operating system, Snow Leopard, in August, Apple this week is rolling out new versions of two of the best- known Macs: its iconic all-in-one iMac desktop, and its least-expensive laptop, the MacBook. Though both new Macs sport important improvements, they are evolutionary, not revolutionary, and neither follows the industry trend toward bargain-basement prices. The MacBook is still $999, and the iMac still starts at $1,199, though the company is giving users more power and features at those same price points. You can pay much less for laptops and desktops from competitors like Dell (DELL) and Hewlett-Packard (HPQ). Apple is, however, introducing one revolutionary product this week: a $69 mouse called the Magic Mouse. It’s the first mouse I’ve seen whose entire surface acts like a laptop trackpad, and allows fingertip multitouch gestures for scrolling and flipping through lists, photos and Web pages on the screen, while still performing traditional cursor movements and clicking. This mouse comes with the new iMac and will be usable on most other Macs as well, once Apple offers a software update for them. It worked well for me. I’ve been testing these new computers for a few days, and I can recommend both. The new iMacs have spectacular screens that are larger and sport much higher resolutions than those on their predecessors. They also add more memory capacity, bigger hard disks and faster processors. The new $999, 13″ MacBook now includes most of the key features of the similar-sized MacBook Pro, which costs $200 more. These include a large multitouch trackpad, significantly enhanced battery life, and a brighter screen. Despite its lower price, the lowly MacBook comes with a 56% larger hard disk (250 gigabytes versus 160) than the Pro model. 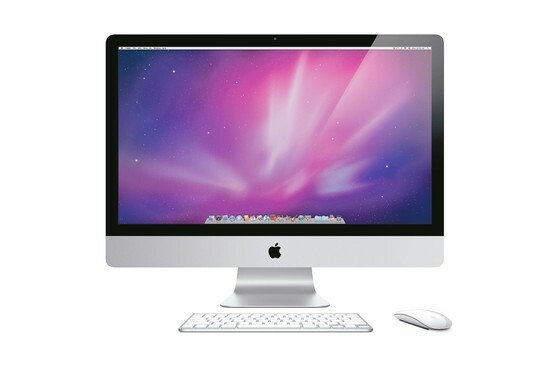 Apple has kept the basic design of the iMac, which looks like a stand-alone monitor but has a powerful computer built in. But the new models have larger, wider screens that have been re-sized to match up with high-definition video. The $1,199 base model has a 21.5″ screen, compared to the old 20″ screen, and has 17% higher resolution. The highest-priced models, at $1,699 and $1,999, have huge 27″ screens, versus 24 inches for the older models, and they have a 60% increase in resolution. The $1,199 base iMac has 4 gigabytes of memory, double the amount in the prior base model, and a 500 gigabyte hard disk, up from 320 gigabytes. The costlier editions have a one terabyte hard disk, which is roughly 1,000 gigabytes. The top model has a more powerful graphics card and a heavy-duty processor. All the iMacs now have slots for SD flash memory cards, and the large-screen models can act as external monitors. In my tests, using a 27″ model, the machine was fast and the screen was brilliant at displaying hi-res photos and high-definition video. Its width allowed me to treat it like two monitors, with, say a Microsoft Word document on the left and a Web page on the right. One downside: the $1,499 model now has a smaller screen—21.5″ versus 24″—though it has a larger hard disk and better graphics card. This 13″ laptop, like its predecessor, is shiny white plastic, but has been redesigned to have more-rounded edges and a rubbery non-slip bottom. It now has the Pro’s large Apple trackpad, which acts as both a huge mouse button and a surface for fingertip gestures like two-finger scrolling, and resizing and rotating photos. It’s still 1.08″ thick—but is a bit longer and wider than the older model, though it weighs less: 4.7 pounds versus 5 pounds. Apple has dropped the FireWire port from this machine, as well as its ability to be run via a remote control. And it still lacks an SD card slot. But it now has a large sealed battery that Apple claims can last up to 7 hours between charges. On my tough battery test, where I turn off all power-saving features and play music constantly, the MacBook lasted just over five hours. In normal use, I estimate it could easily top six hours. In my tests, this MacBook was fast and reliable using a wide variety of programs. It started up cold in a mere 22 seconds, and was ready to go after a restart, with several programs running, in 44 seconds. For anyone on a budget, it’s a better deal than the 13″ MacBook Pro, especially considering its larger hard disk. These new models now round out a full line of refreshed Macs, but they will face stiff new competition from a horde of PCs running the new and better version of Windows.